This picture frame design pen and pencil cup is perfect for preserving cherished memories. 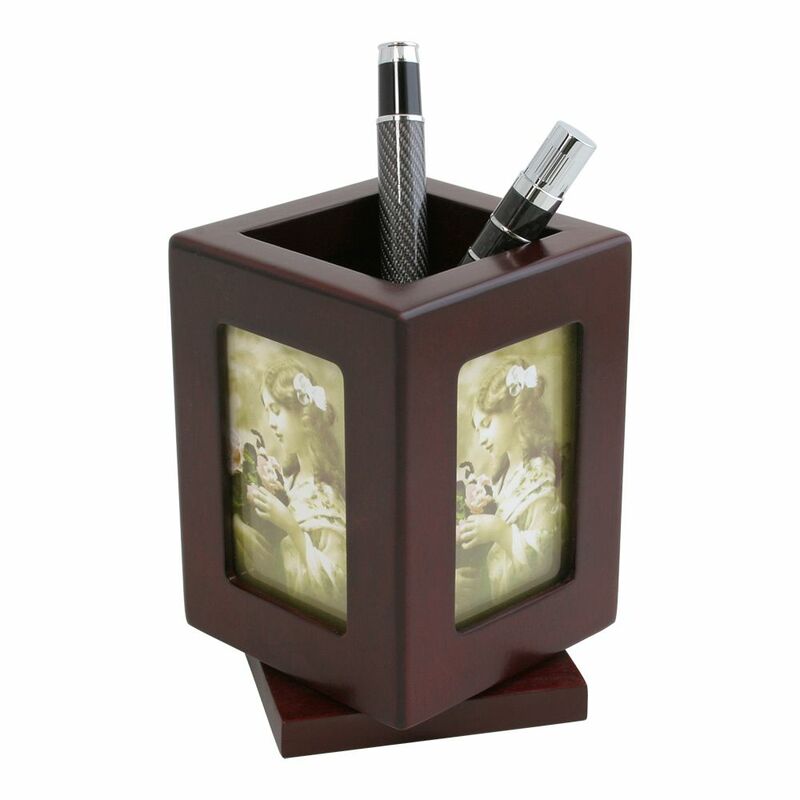 Made to look right at home on your office desk, this unique pen & pencil cup comes with a smooth rosewood finish. 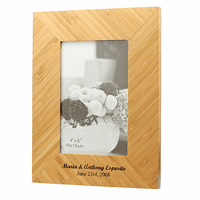 It features three picture frames (each holds a 2 5/8" x 3 5/8" photo) and a revolving base. The fourth side can be laser engraved with the personalized message of your choice free of charge. 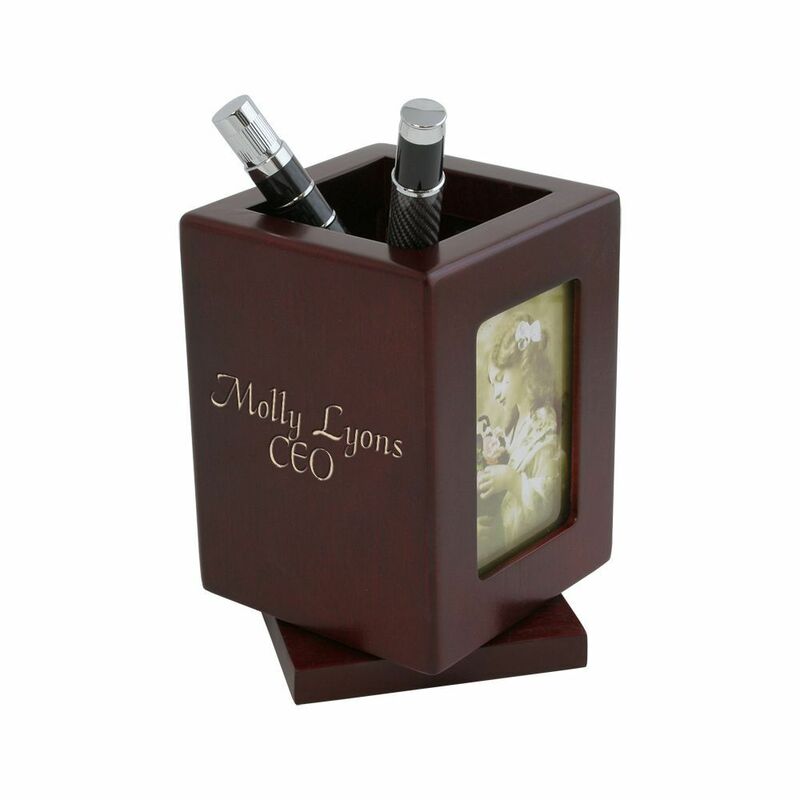 This customized pen and pencil cup is ideal as an employee recognition award or a corporate gift. 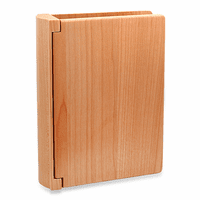 Dimensions: 3" x 3" x 4 1/2"
How can I upload an image or logo to be engraved into the cup? I only see options for text customization. Thank you! There is a five piece minimum order. If you are ordering five ore more, you would just place your order but under engraving put ***LOGO***. Then reply to your order confirmation email with your logo. We'd put together a proof for your approval or editing within 2 business days. I was wondering if you engrave an image that we send you onto the Pen holder? We were hoping to get Japanese characters engraved. Also about how long it would take. We will be heading to japan and need it before then? 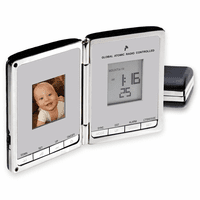 Yes, we can engrave a logo or image. It just needs to be in black and white format. We've added a Logo Upload checkbox on the item page, right below where you add text for personalization. Please let us know if you have any questions. The weight is exactly the same. They both have wood bases so they are a good weight. 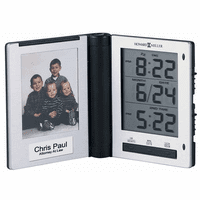 It holds 2" x 3" photos, which can be inserted with a twist of a metal tab. I had seen this item on another website but it was too expensive so I didn't get it. Was so excited when I found it here for a great price and with fast delivery. This is the perfect addition to his office. I was able to add wallet sized photos of the kids as well as his title. I can't wait to give it to him!